Photo Gallery of Past Events: to enlarge the photo and read a caption describing it, simply click on the photo. 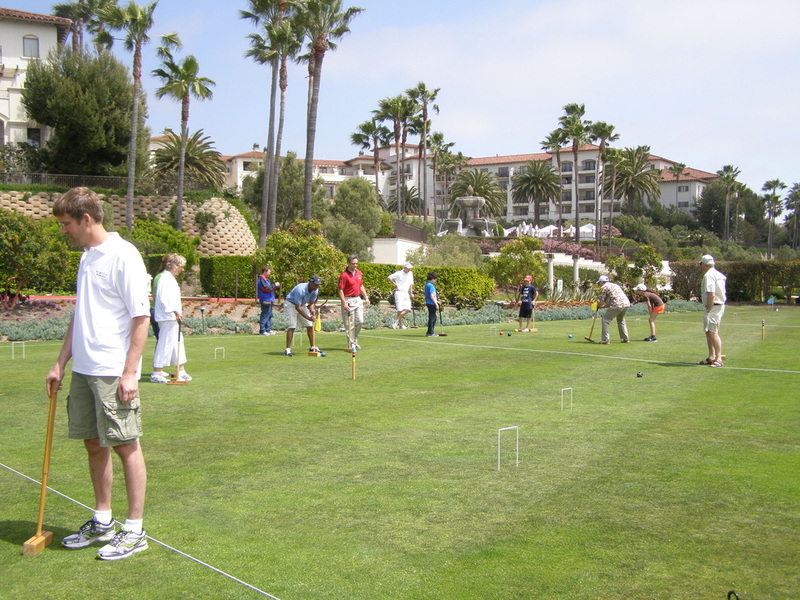 June 11-12, 2016: Sixth Annual Kamal Cup Golf Croquet Singles. May 7th, 2016: Kentucky Derby Day! 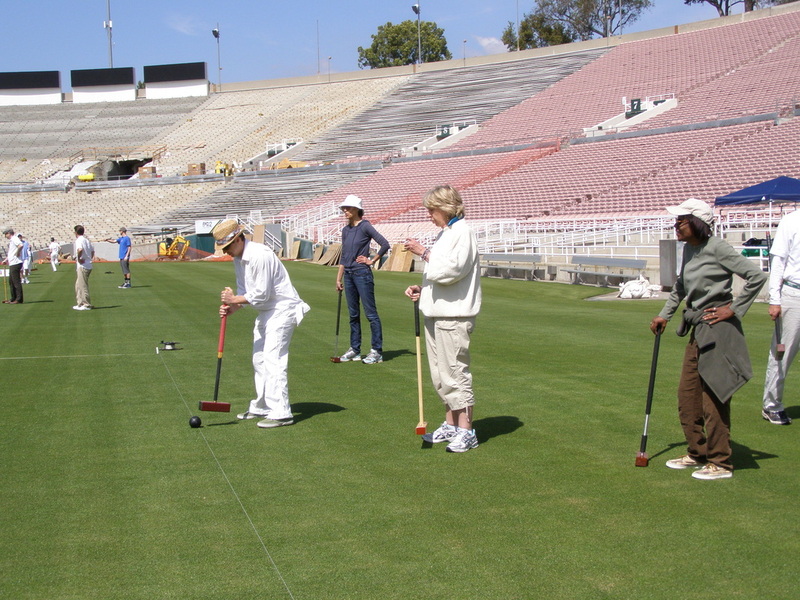 June 26-29, 2014: The 6th annual Pasadena Croquet Invitational. Our flagship event! Eight of the nation’s best players competed in this Association Rules tournament. Rhys Thomas served as tournament director. Hoop clearance was exceptionally tight and was set to 1/64th of an inch on the final day of the tournament. 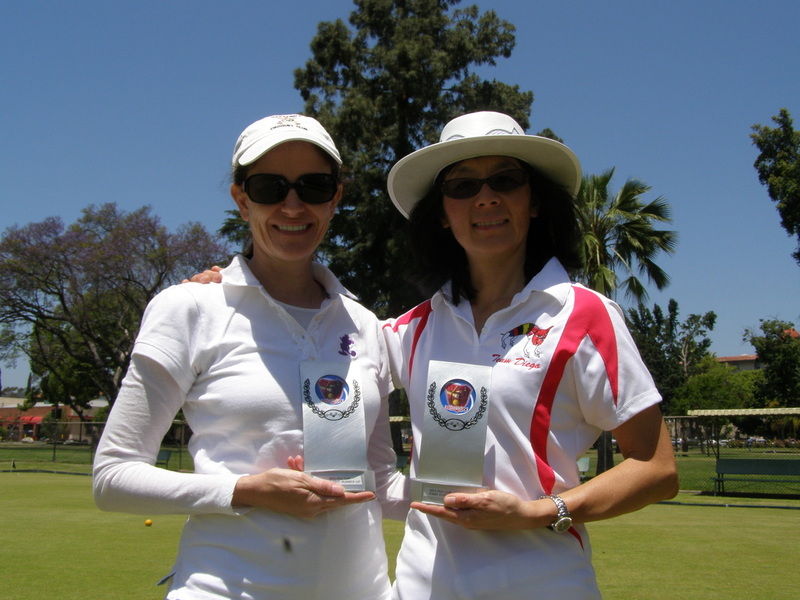 April 2014: Morford Mallets Golf Croquet Doubles. This year our club GC doubles tournament was again sponsored by Bob Morford, who makes beautiful custom-built croquet mallets (Morford Mallets). We had two flights, Open (for intermediates) and Championship (for advanced). 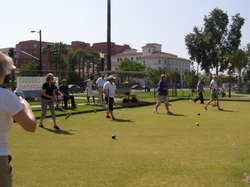 Players came from all over Southern California and the desert area. 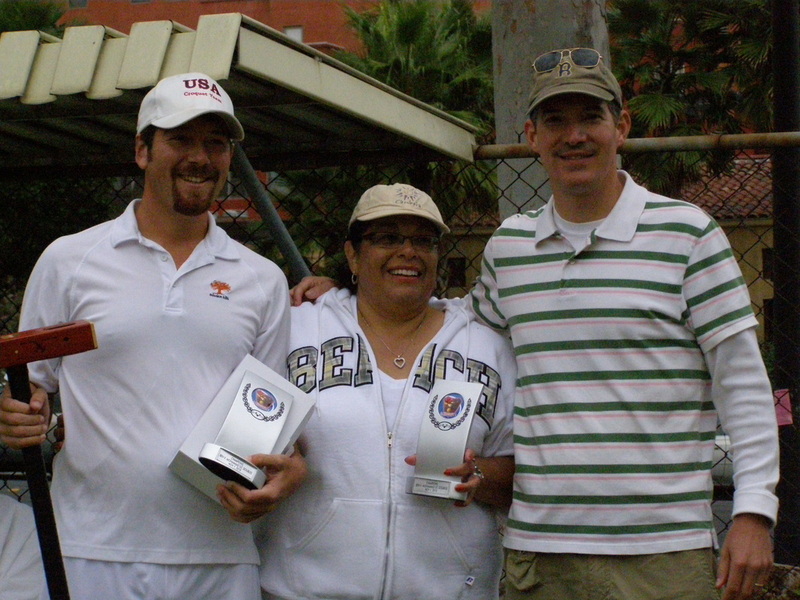 Kory & Betty Teoman (yellow team) lost to Caren and Eric Sawyer (white team) in the Championship flight finals. 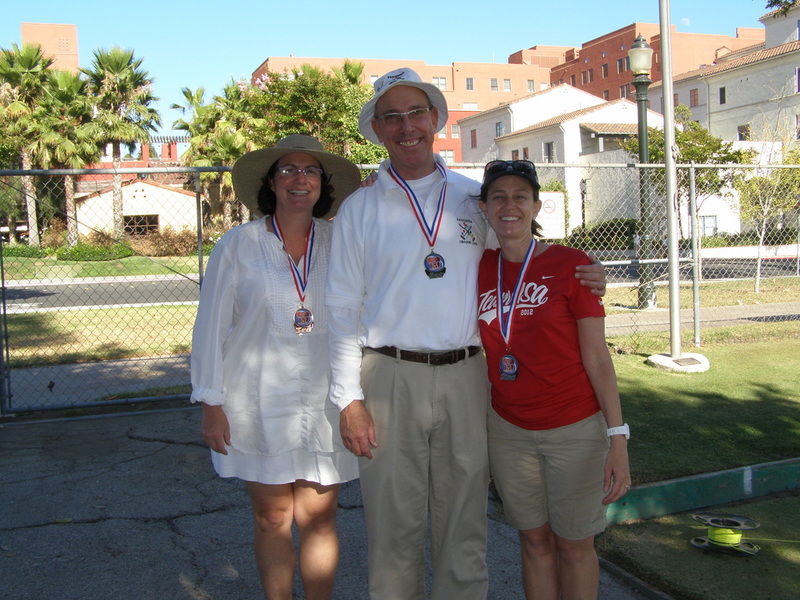 Judy Warren and Debra Bradley (left) of the PCC win the Open flight over Michelle and Brian Esteson of the desert. Bob Morford is in the middle. 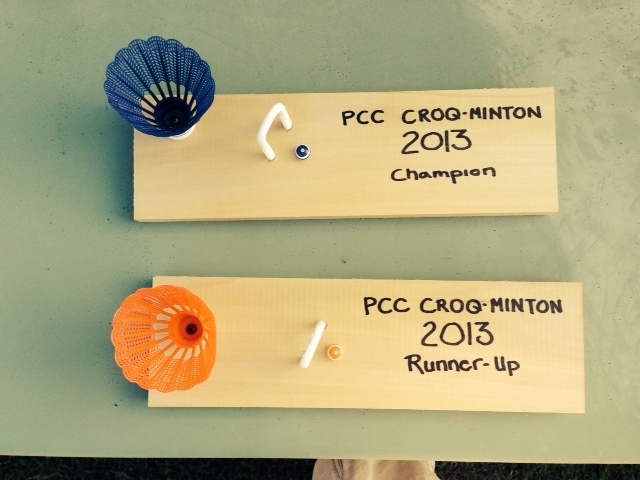 December 2013: Croq-Minton- A cross between croquet and badminton. Inspired by Robert Fulford of the UK. Each wicket is a court. A ball that does not run the hoop is like hitting the badminton birdie into the net. If you run the hoop but your ball crosses the boundary line, it's like hitting the birdie out of bounds in badminton. 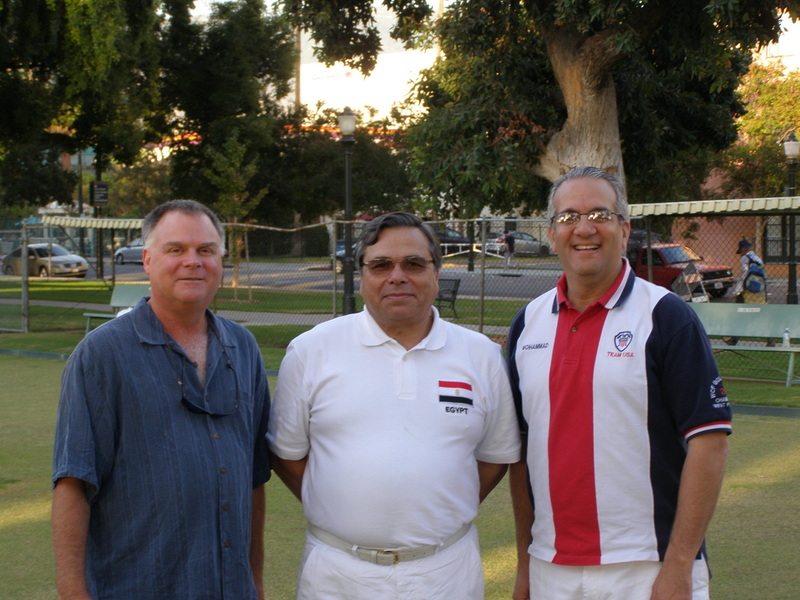 Our club was honored to host Amir Ramsis Naguib, the President of the World Croquet Federation, who was visiting in Southern California. Mr. Ramsis is from Cairo, Egypt. Mr. Ramsis is in the center of the picture. To his right is his good friend, Dr. Mohammad Kamal. 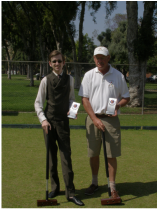 To his left is Rhys Thomas, US Croquet Hall-of-Fame Inductee. 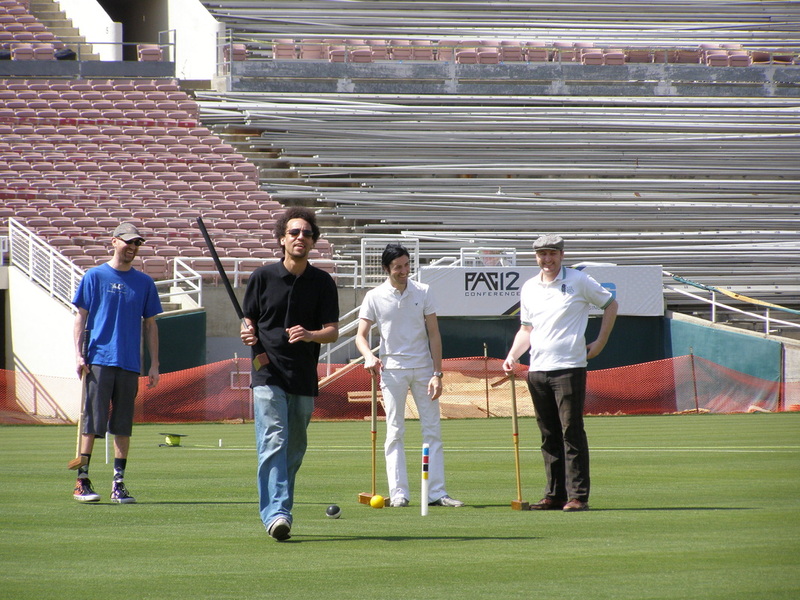 Mohammad and Rhys are both members of the Pasadena Croquet Club. 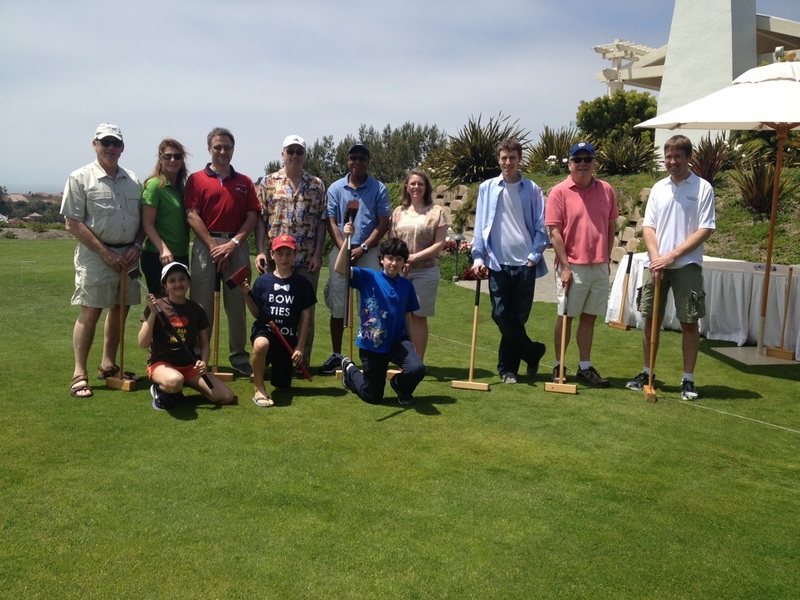 July 2013: The second annual Crazy Croquet. 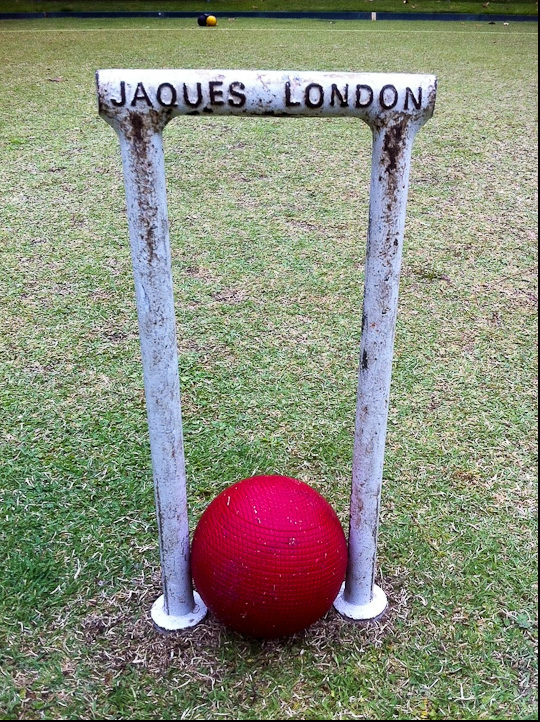 A mix between miniature golf and golf croquet. There is a challenge to each of the nine "holes" in contention. Free margaritas and wine were par for the course. So is the Silent Auction. The first hole, the "sand trap." The ball got stuck on top of the sand dune. Sharon Schach from Simi Valley was the winner, shooting 60. 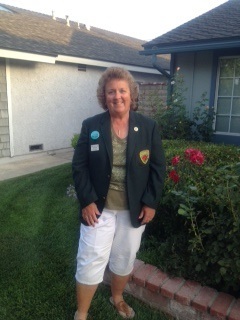 She gets to keep the green jacket for the year! 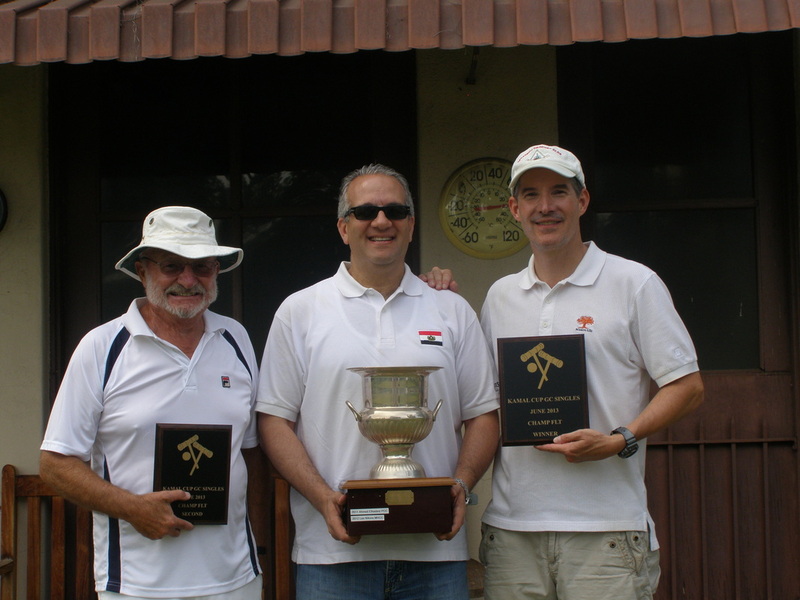 June 2013: Third Annual Kamal Cup Golf Croquet Singles. Newcomer Judy Warren is the upset winner in the Second flight. Eric Sawyer finally wins the Championship flight. Second Flight: Judy Warren (left) unseats last year's winner Debra Bradley (right). Dr. Mohammad Kamal (center) hands out the runner-up award to Jim Butts (left) and the Kamal Cup to winner Eric Sawyer (right). 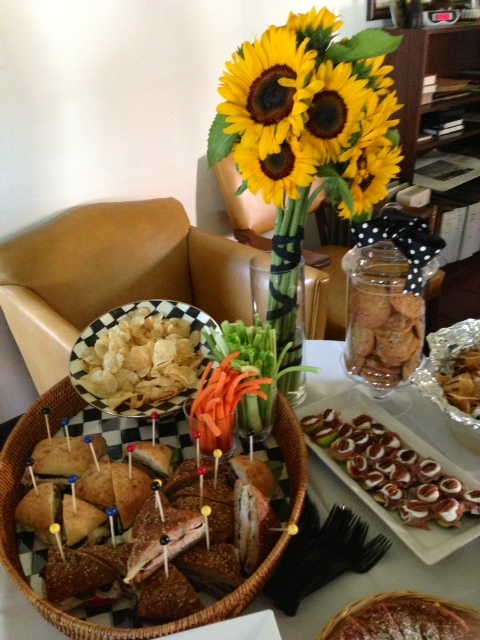 May 2013: Kentucky Derby Day. 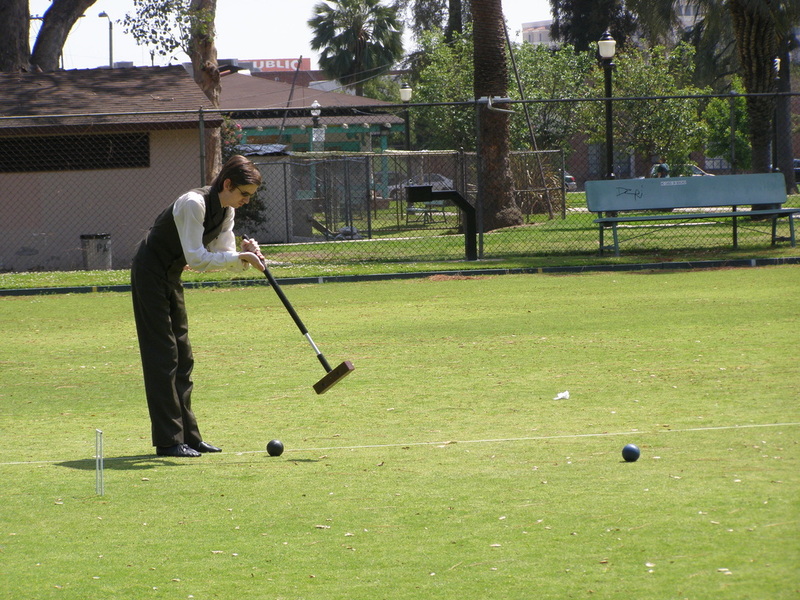 Those in attendance played two horse-racing themed croquet games. In the Bell-mont, players got one shot every time the bell was rung. The first to run all six hoops and hit the peg in their lane won. The Preakness was a cut-throat six-wicket game. The first to run all six hoops in order and peg-out won. 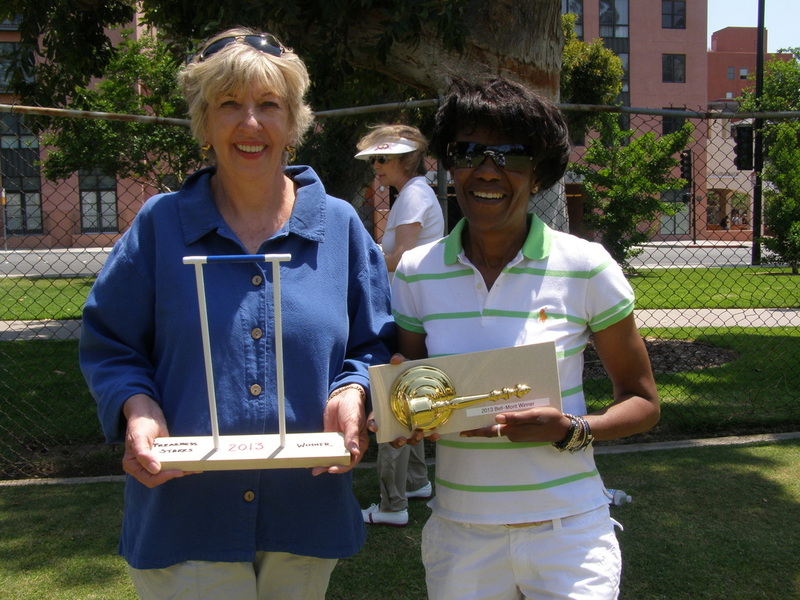 Debra Bradley (left) won the Preakness "Blue Wicket Award." 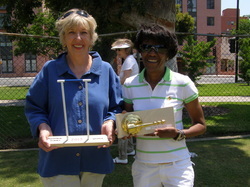 Cheryl Davis (right) won the Bell-mont award, which was a mounted bell. And they're off! An early heat of the Bell-mont race. 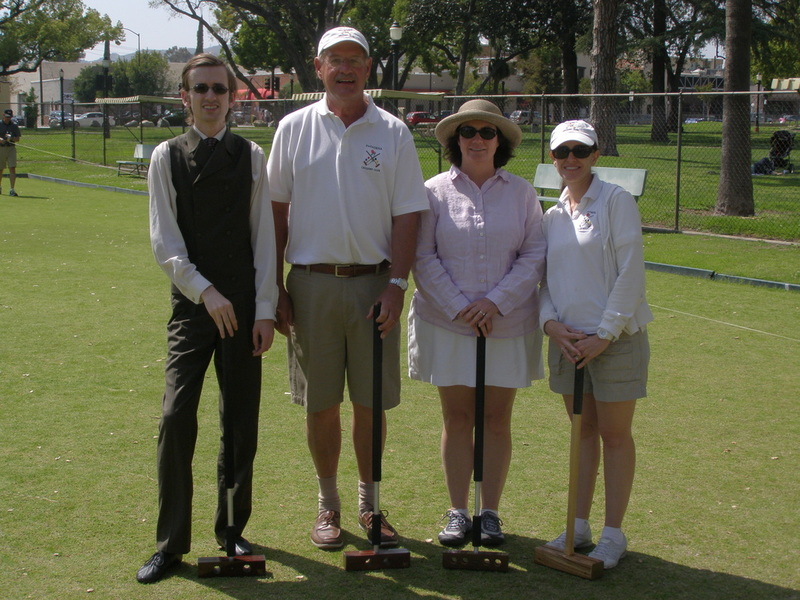 April 2013: Croquet Party for the American Bar Association. 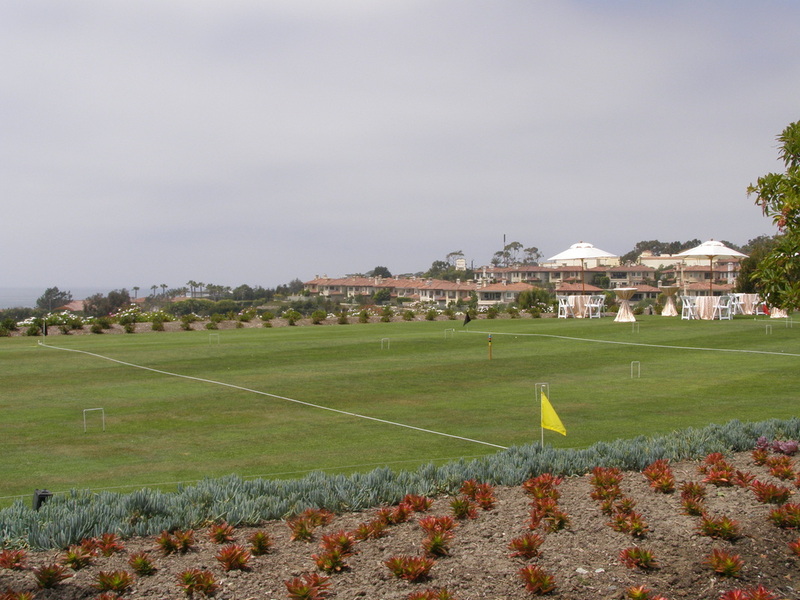 The PCC was hired to run a golf croquet party for the ABA's annual construction litigation seminar at the Monarch Bay Resort in Dana Point, Orange County. We were thrilled to receive a visit by dignitaries from the World Gateball Union on a leg of their world tour. The WGU is headquartered in Tokyo, Japan. 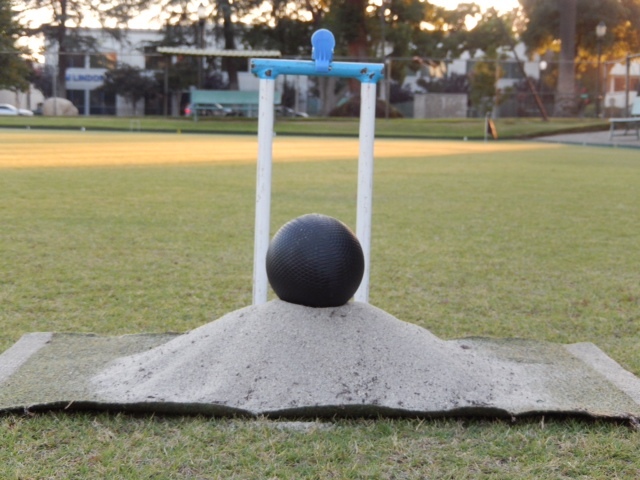 Gateball is extremely popular in Asia, with millions of players in many countries. 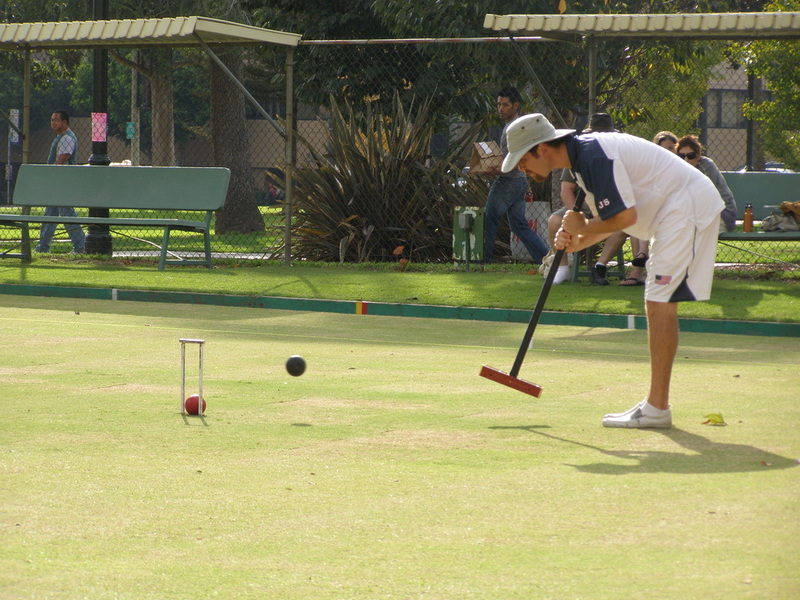 The World Croquet Federation and the WGU have recently agreed to colloborate, given the similarity of our two sports. We hope to host a regional gateball event in the near future! 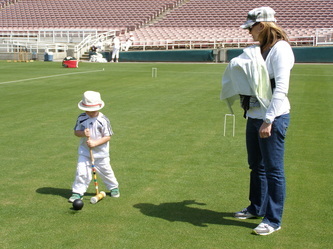 March 2012: "Croquet at the Rose Bowl." 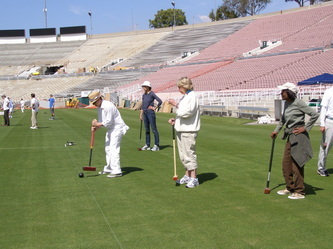 Five croquet courts were placed on the football field of the world famous Rose Bowl for members of the public to play. 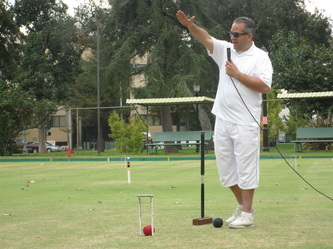 March 2012: The United States Croquet Association names Eric Sawyer of the PCC "District President of the Year." Last year's District President of the Year Mike Orgill (right) hands the award this year to Eric Sawyer (center). Mike started his presentation by saying, "as I told them in Florida when I accepted this award on behalf of Eric, 'this was the least deserved award of the year." Ha, ha. 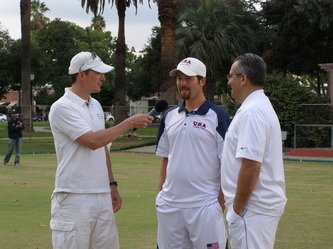 Ron Hendry, USCA Western Region VP (left) looks on. April 2012: Castle Green Tour. 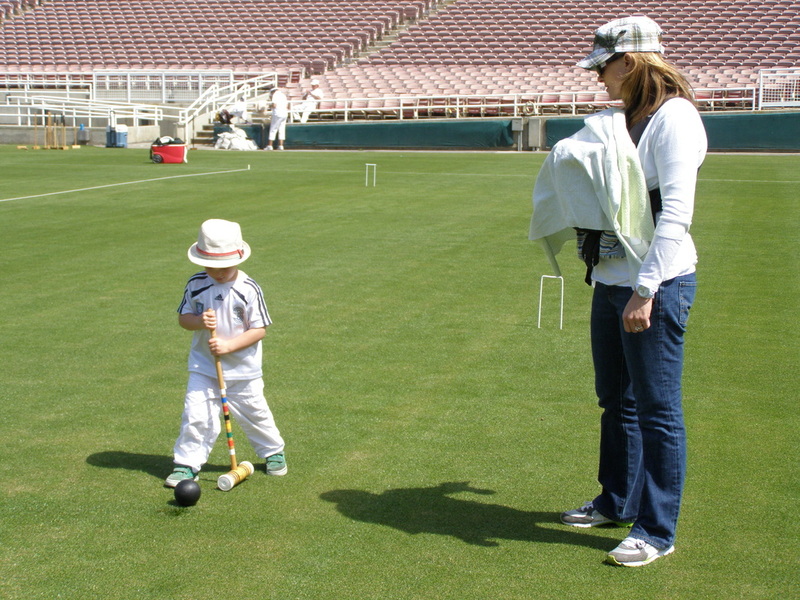 The PCC put on a croquet demonstration during the public tour of the historic Castle Green in Pasadena. 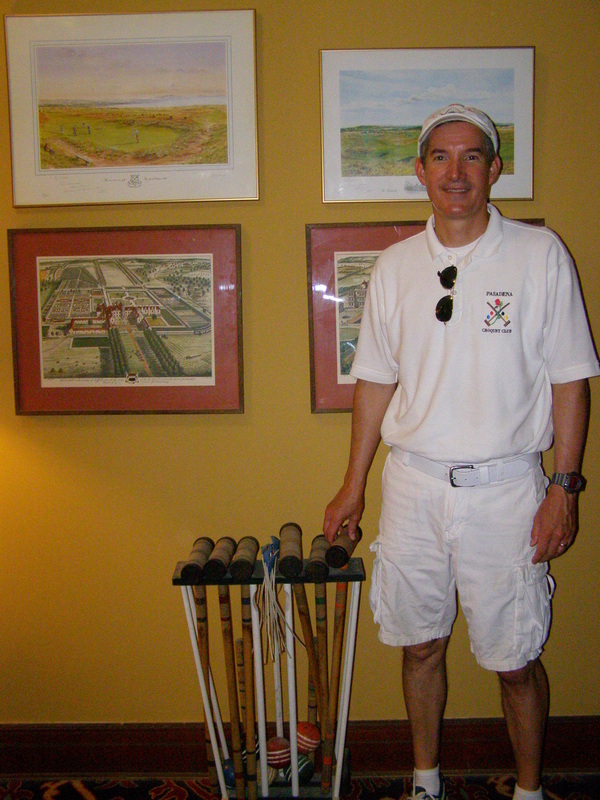 The ubiquitious picture of me standing near an antique croquet set spotted during the tour. 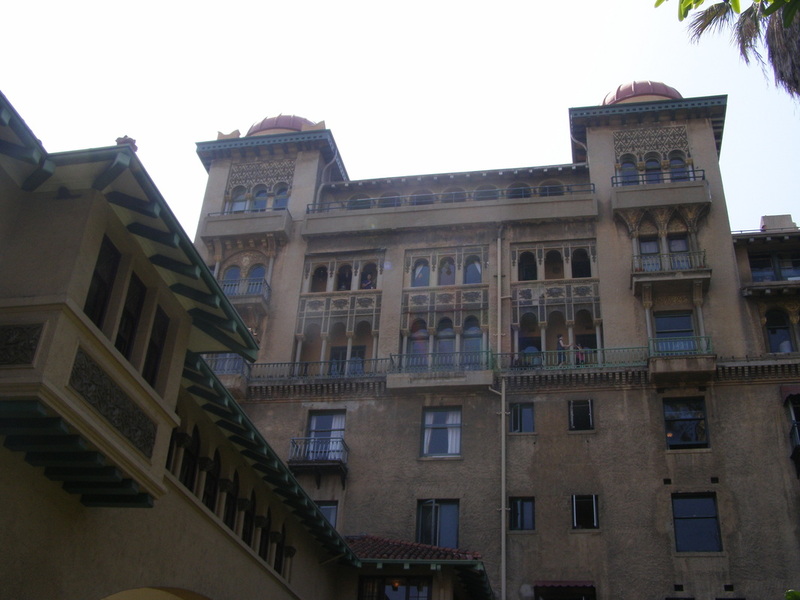 The star of the show, the historic Castle Green, once the premiere hotel in Pasadena, now a residential cooperative. 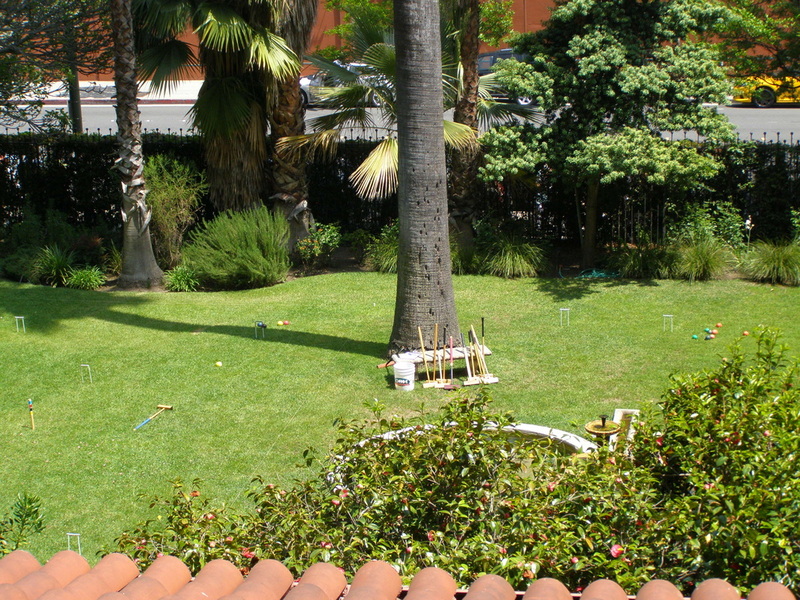 We set up two croquet courts on the north lawn, just to the right of where people entered the property for the tour. 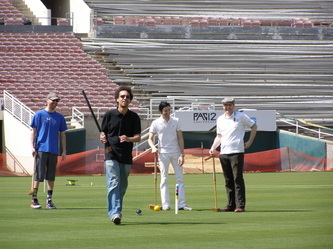 May 2012: 3rd Annual Ornery Ostrich 9W Doubles Tournament. This event was originally scheduled for March, but we were rained out twice. This year's winners are the "Super Team," comprised of Michael Rumbin and Constantine Evans, who defeated in the finals the "Gal Pals," i.e., Heidi Rasmussen and Caren Sawyer. The shot that won the tournament. Constantine rushed from deep near corner IV to mid-court to start his "loose" three-ball break. The finalists: the Super Team on the left, the Gal Pals on the right. 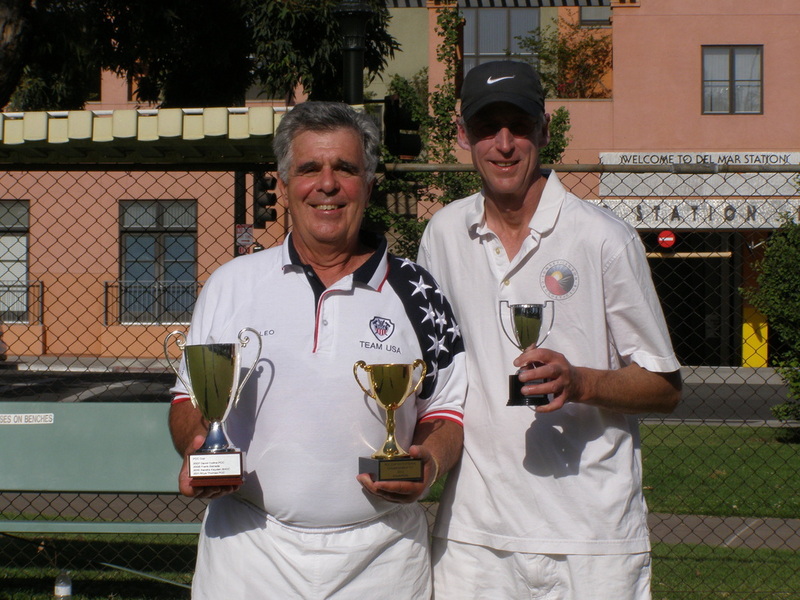 The champions, the Super Team, Constantine Evans (let), Michael Rumbin (right). 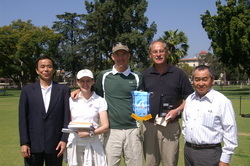 May 2012: 5th Annual PCC Cup Invitational. Our flagship event, this is an Association Rules singles tournament played every Memorial Day weekend. 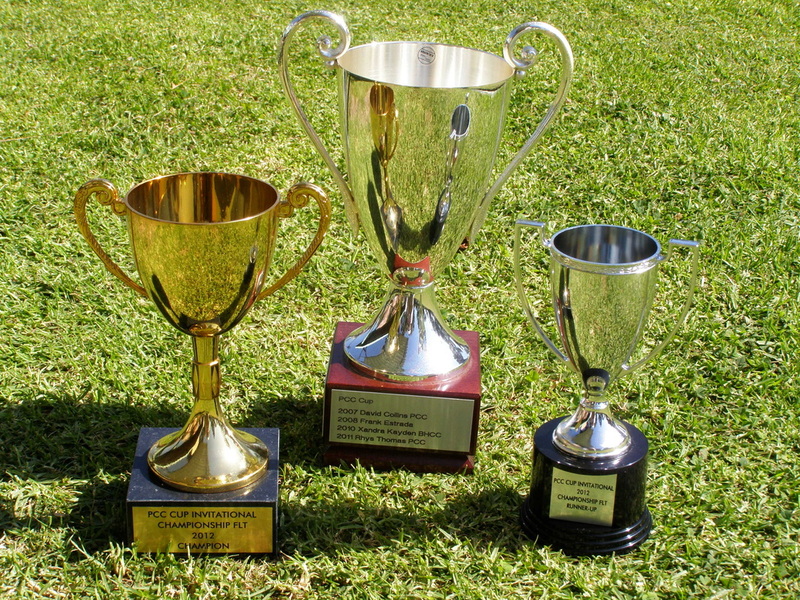 The awards this year in the Championship flight, winner (left), the perpetual PCC Cup (center), runner-up (right). 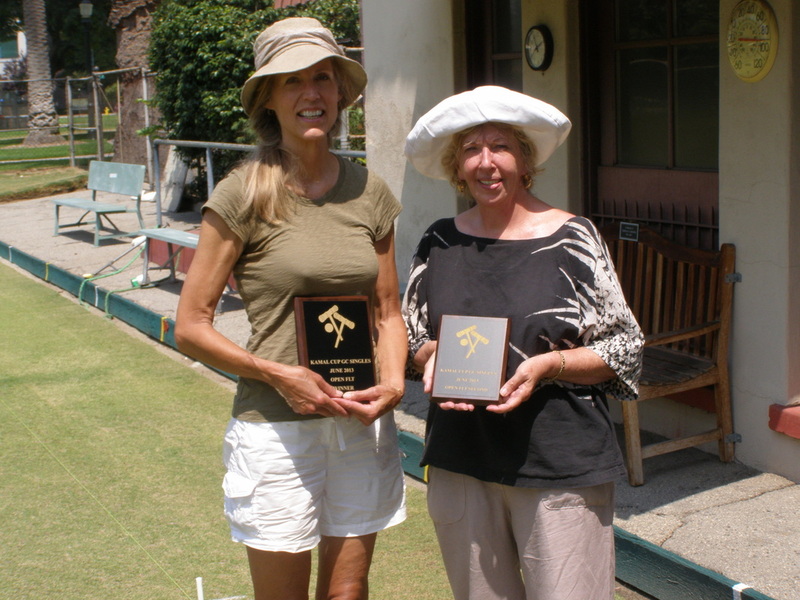 First flight finalists, Caren Sawyer (left) runner-up, and Val Terry (right) champion. Championship flight finalists, Leo Nikora (left) champion, holding the PCC Cup and flight award, and David Collins (right) runner-up. July 2012: The Croq'athlon. 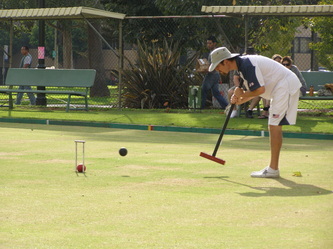 An Olympic-style event, each player tries their luck at six different croquet skills shots. Medals are given to the top three finishers. 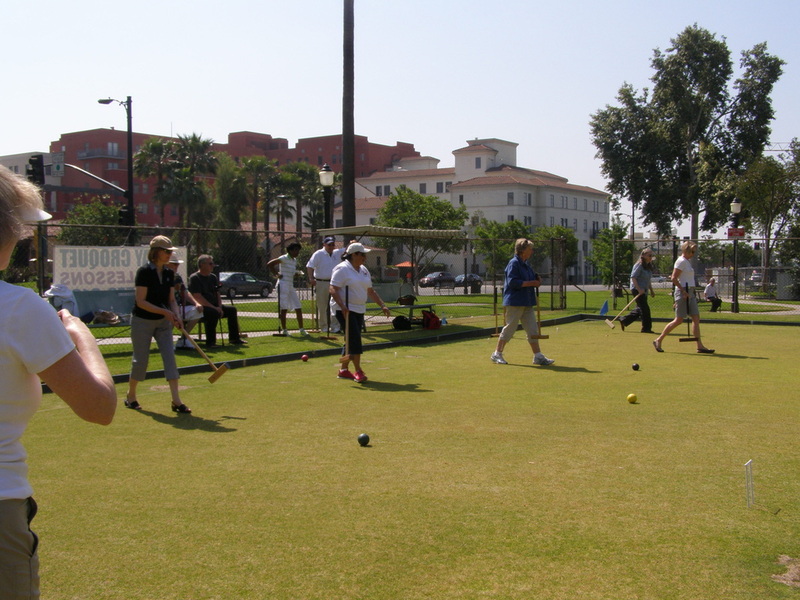 We raffle off vaguely related croquet items and also have a silent auction. 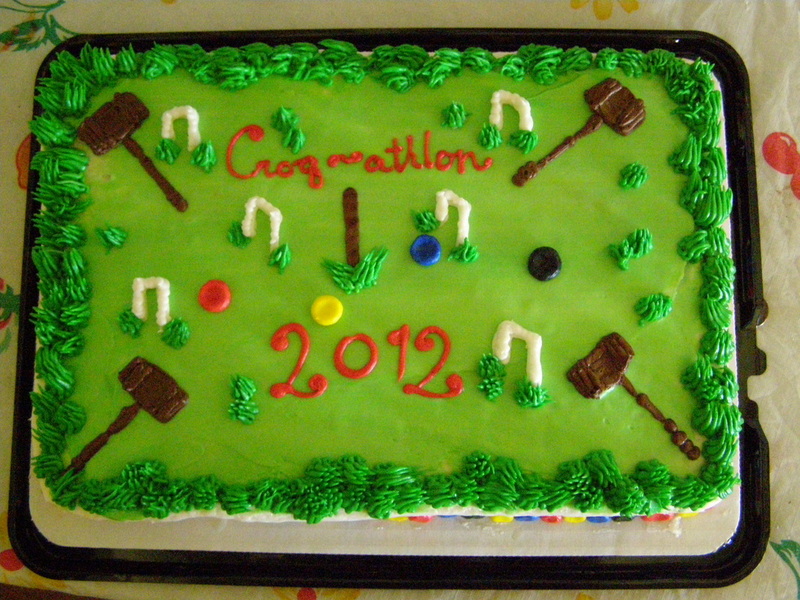 The cake decorated to look like a croquet court that we ate after the awards were presented. 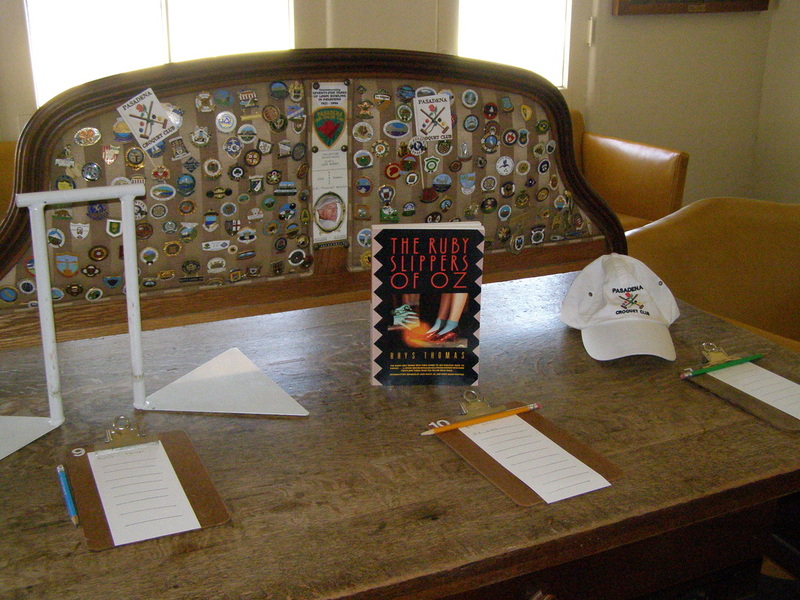 The silent auction items (left to right): indoor wicket; Rhys Thomas' book about the Ruby Slippers from the Wizard of Oz signed by the author; and a Pasadena Croquet Club baseball cap. The medal winners from the left: Heidi Rasmussen (bronze); Scott Rasmussen (gold); Caren Sawyer (silver). 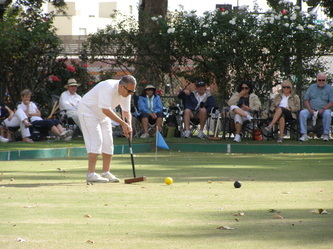 Tony Griggs is a member of the Nailsea Croquet Club in Great Britain. He visits the South Bay every Fall. This year, he challenged Michael Rumbin of the WoodRanch Croquet Club to an Association Croquet game played under the Advanced Rules. 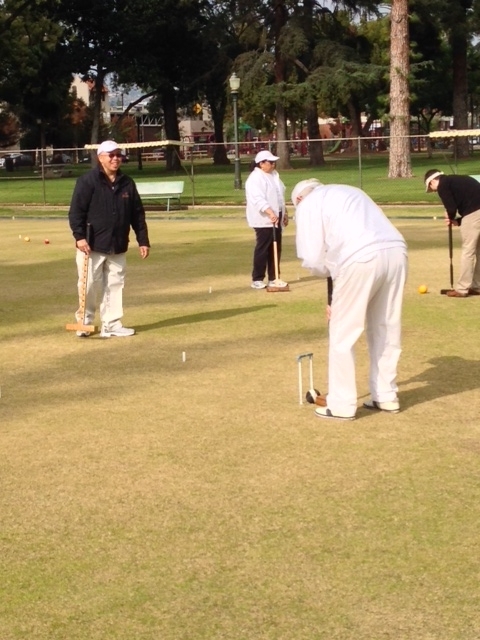 In a very close match, which went back and forth, Michael prevailed by just one wicket! 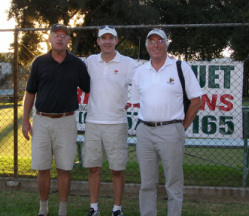 Afterward, Tony was gracious enough to buy beers for Michael and the spectators of the match, Eric & Caren. Cheers, Tony. Pictured, from the left: Michael, Eric and Tony. 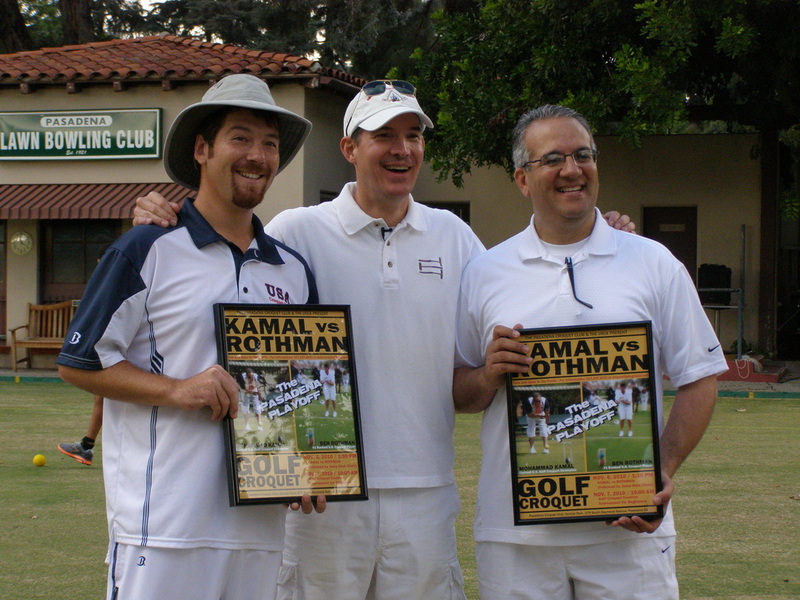 November 2010: "Ben v. Mohammad," Ben Rothman and Mohammad Kamal, two of the best Golf Croquet players in the World, played each other in an exhibition match at our club, in front of many spectators from around Southern California.